Five reasons why you should grow cucumbers up on a trellis no matter how big your garden is for the best results. Follow this simple tutorial on how to grow them vertically for your best crop yet! 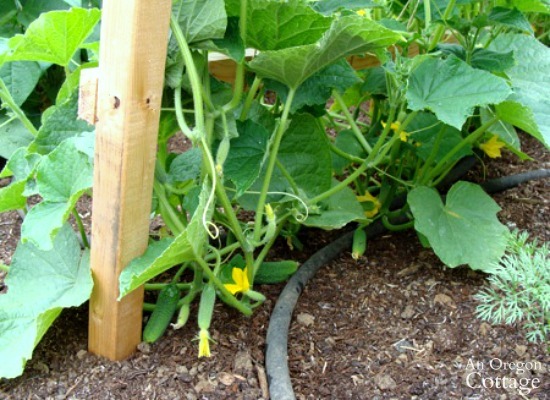 Do you grow cucumbers on a trellis or let them sprawl on the ground? I’ve always grown them on a trellis because I didn’t want them taking up too much room. But over the years I’ve discovered that there are a lot of other benefits to growing cucumbers vertically even if you do have lots of room in your garden and are not trying to “Square Foot Garden” or save space. I think you’ll agree with me, so after I share why to grow cucumbers up instead of out, I’m also explaining exactly how to do it, since you’ll need to do a few things differently. 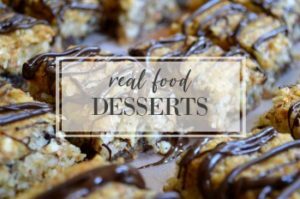 It’s worth learning a few new techniques – I promise. The plants are easier to water at the main stem, which keeps the plant leaves drier (this is recommended to help keep fungal diseases at bay). The fruit is easier to harvest. They are hanging nearer to eye level and are easier to spot, plus the prickly stems and leaves are neatly confined so the risk of getting all scratched up is minimized (this is the biggest benefit in my book!). The fruit is cleaner when it doesn’t touch the dirt. The fruit is a uniform color (no light spots where they rested on the ground). The fruit is straighter, with less misshapen ones. All this is in addition to the smaller footprint needed to grow a large number of cucumbers! Are you convinced? I thought so. While cucumbers are easy to grow vertically, there are just three things you’ll need to do differently to grow cucumbers up instead of out. I’ve found that an A-Frame trellis made out of 1″ x 2″ boards (like the one pictured above that Brian made for me this year- it folds down for easy storage!) or bamboo poles work the best. They can be grown up a single trellis (meaning a trellis between two posts vs. the A-frame), but it will need to be secured more than normal to be ready for the full-sized plants loaded with fruit. Update: The wood trellis pictured lasted about 4 seasons before the legs rotted out. I have since found 10-ft U-shaped rebar that we fashioned an a-frame trellis from so they won’t rot at the legs. 2. Train the plants up the string (or fencing, or whatever you use) during the growing season. This is not difficult- it takes about five minutes as you’re working or harvesting in the garden. Just wind the plants around the string one or two times and they will take it from there. Oh, and don’t you love the watch? It’s my super stylish dollar-store watch that helps keep me on task in the garden. I’m known for losing track of time out there. I’ll go out to do a few things at 11:00 am and before I know it, it’s 2:00 pm, and I’m thinking: “No wonder my stomach was growling…” Which, come to think of it, is much better than Brian coming out to ask me, “Didn’t you have a dentist appointment?” Ugh. Definitely. Need. The. Watch. 3. Water from the bottom. 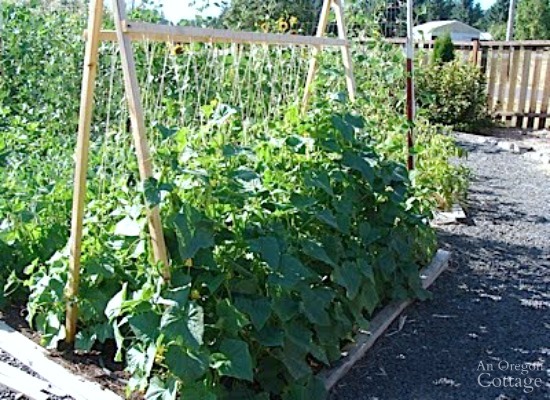 While trellising and training are really the only things you have to do, I think using a soaker hose is a really smart idea (but I think that for a an entire easy care garden, too). It waters right where you need it, doesn’t get water on the leaves (wet leaves contribute to diseases like mildew), and waters deeply. I turn the hose on for about 2-1/2 hours once a week (every 5 days if it’s really hot) and the plants are growing great. If you live in a hotter climate, you can add some type of mulch to the soil to help keep the moisture in. 4. Easily harvest the fruit. The very first cucumbers grown on a trellis will appear at the bottom (like the photo in #3 above), and may be a bit dirty, but once the plants have grown up the trellis a bit more, you will just be able pick just by reaching in, push the leaves aside and grab a perfect, mostly straight fully colored cucumber! And as they grow taller (the photo above is two weeks later than the picture at the beginning of the post) you might not even have to stoop to pick the fruit! Although it is really nice that they do take up less space, too. 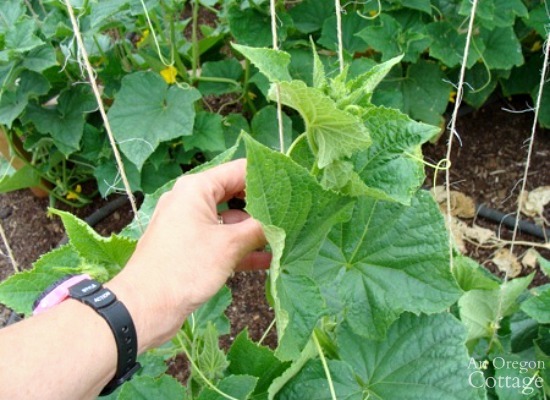 You will be able to plant the cucumber seeds closer together (I plant about 2 inches apart and then thin to 5-6 inches apart) because you are training the vines up. This of course means you will have a much larger harvest in a smaller space than letting them sprawl on the ground. But that probably goes without saying, because that’s why we like to grow vegetables vertically. And even though it’s not a part of the “official” 5 reasons to grow cucumbers on a trellis, it’s a pretty good one still, right? Can you tell I really like growing cucumbers this way? 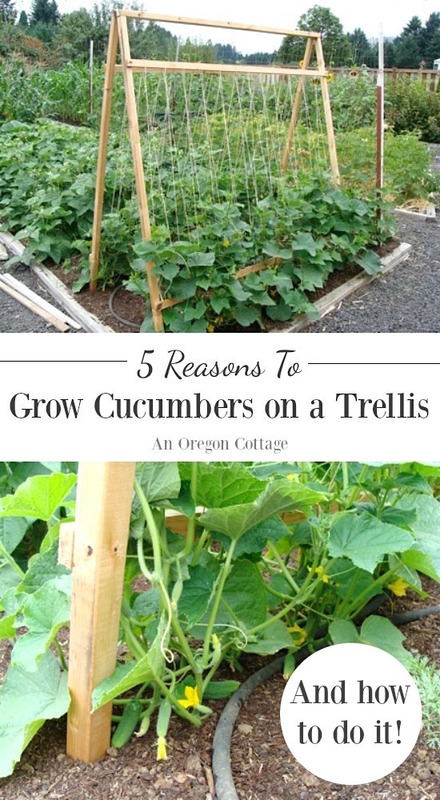 Do you grow cucumbers on a trellis? Why or why not? This article has been updated – it was originally published in August of 2011. Can the cukes be f grown in full sun facing west? Yes, the more sun the better! Great! Hope it you love it. If it’s working for you and keeping the fruit off the ground and easy to harvest, that sounds good to me! If there’s about 6 inches between the plants, that should be okay. So I didnt trellis(first year gardener), i have cucumber popping up all over. The viens are flowing into my peas, beans and Peppers. They are overwhelming this part of my garden. Do you think it is too late to try to trellis and train my vines up, or should I try to pull a plant or 2 out to clear some space for some to grow? Great write up! We just started our cucumbers, zucchinis & squash this year and I plan to build trellises very soon to take them vertical. I was thinking of plasti-dipping the ends of the wood to prevent rot. Did you guys try anything like this before going to metal? Good info. I’ve been overwhelmed by all the different types of trellises available. Got some old wire fence and leaned it at an angle against my fence. I put a few vines thru it, but the rest aren’t long enough. I now have confidence my cukes will stay off the ground. I think I’ll try it with my mini pumpkins! I love using what you have, Anne – this sounds like a perfect solution! Did you use instructions to make the trellis or did you improvise? Would love to know specifics on construction. My husband made it and just improvised. He made the side frames from 2x2s and hinged them at the top with old cupboard hinges. 1x2s were used across the top and bottom – these are what I strung the twine around, up and down. We just used what we had and unfortunately it only lasted about 4 years before the ends that were in the ground rotted. I guess that’s not bad for using what we already had, but we’ve since found large u-shaped rebar that we’ve adapted to make the cucumber trellis. Hope this helps some! We’ve grown out cukes vertically for years. But a few years ago repositioned the trellis we use, and I noticed less of a harvest. I’m wondering if having the trellis in a east west placement is the cause of this? Plants are on the north and south sides. It seemed like we got 2-3 times the harvest when the trellis was north south placement. Plants were on the east and west sides. Has anyone else noticed this? Hmm, I haven’t noticed it, though I’ve always grown them with the plants on the east and west sides (the ends being N-S). Hi Jami, How tall is your trellis and how far apart at the bottom? Did you make it wide enough to go under the “A” frame to collect Cucumbers? The trellis is about 6 feet tall and then when I spread it out it’s about 5-1/2 so I can easily reach the top (I’m 5’5″). No, I can’t go under the frame to collect, but it’s easy enough to reach around. Love this trellis idea! Your blog is so upbeat, positive, informational. Thank you!! Thank you, sweet Andi! 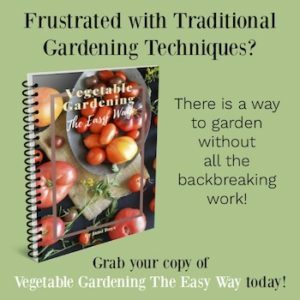 I won’t grow cukes any other way now – harvesting is SO easy. My vines are doing so well this year. They are growing beyond the end of my trellis. I started weaving them back through. If I cut the vines back will it help or harm them? Good to hear! I just let them fall back around the top, Tammi, since the cucumbers will keep producing up the vines, closer to the ends. I’m afraid if you cut them, you would lose harvest. 1. Do you plant on both sides (outside & inside) of each frame? 2. Do you recommend pinching them as they grow? The twine idea makes a lot of sense to me. Thank you for sharing your ideas– I just love it. Thanks, Dinyar! 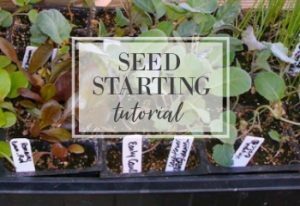 I plant one row at the base of each side of the frame, with seeds 1 inch apart and thinning to 2-3 inches apart when the seedlings are about 3 inches tall. 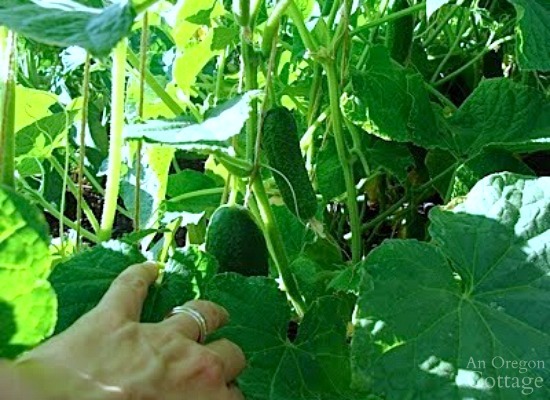 I do not pinch cucumbers – I’m not looking for bushiness, since I want them to grow as a vine. I wish you success in your cucumber growing endeavor – I love growing them up and will never go back to on the ground! 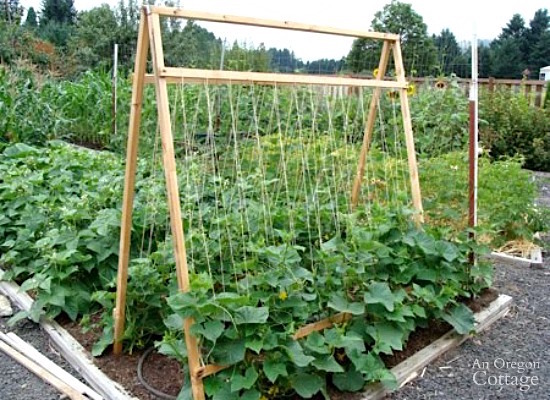 Do you plant your cucumbers on the inside or outside of an A frame trellis? I plant them right along the bottom, Lauren, on the outside and then twining them up as the grow. Your site is wonderful and so glad i discovered it! Thanks! I want to plant seedless cucumbers in the spring, but i would like it to be organic. Last year i had a hard time finding anything at my local suppliers. Do i have to order them? Any suggestions? Bought these Pickling Cucumber Seeds the other day. Planted some in germinating pots, and they’re popping up already. Now I was expecting to mosey a bit, looking up at the sky, picking a weed here and there, etc., etc. Now I find that I Hafto Do Some Actual Work !. Oh, love the watch. I don’t wear one, cuz I don’t remeber why. Now I was looking for a quick fix as I have chicken wire and a big window window-less frame. Came across this site, quite amusing and informative in a fashion to those who reads the comics qite fundamentally. I like your trellis. I also like it because someone else designed and built it. I grow a lot of my plants in buckets, holes drilled in them. I get many from Dunkin Donuts. The pickle buckets from a Wendy’s are better. And I take photos and post everything to Google+ and Facebook. I didn’t get to my trellising and am wondering if anyone has tried training them late in the game after they are crawling on the ground a good bit? I run a very large foodbank garden and sometimes chores get away from me!! You can certainly try, Hallie! maybe just a lower trellis that you could set the vines on or something? I have been using trellises for years and enjoy the cleaner pickings. I build mine straight up and space cucumbers 6-8″ apart. Wait for seedlings to appear and then tie twine. About 4′ tall to a wood horizontal nailed to stakes every 8-10′. Easier to water roots and to keep weeds out. Happy gardening. Hey, I have a few cucumber plants, and this morning the baby fruit off the flower is brown with white spots. The other plants seem unaffected. It is the largest plant that is exhibiting this trait. It lives right next to my tomato plant, and gets daily soaker hose watering due to our super hot Florida. Any ideas for me? Is my plant OK? The leafs at the top are super green and the size of a DVD. The leafs at the bottom are green and some yellow, and smaller in size. Sometimes there are a few fruits that don’t make it for some reason or another, James – I’d remove the affected fruit and if the rest of the plant is healthy, just wait for more to form, keeping an eye on it. Oh, and even in hot climates, I’d make sure your plants really need water every day by testing the soil down to an inch – if it’s moist at an inch, cut back to every other day (too much moisture can cause flavorless fruit).